Rinnai RC98 indoor and outdoor model review. 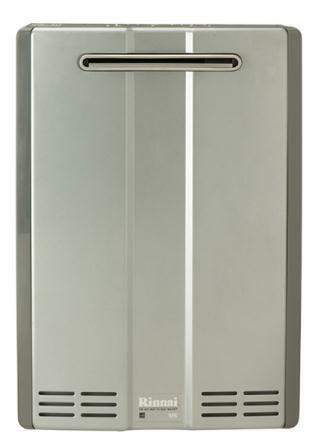 Models RC98i and RC98e as the condensing water heaters are one of the most powerful tankless units Rinnai offers. Check out the features and specs. RC98 tankless water heaters are part of the Ultra Line series that features models with the ultra-efficient condensing technology and superior performance. High efficiency is what makes them Energy Star compliant and eligible for additional savings through the government grants and utility rebates. Rinnai RC98 series is the latest addition to Rinnai tankless water heaters, but this time utilizing the advanced condensing technology and very high energy factors. 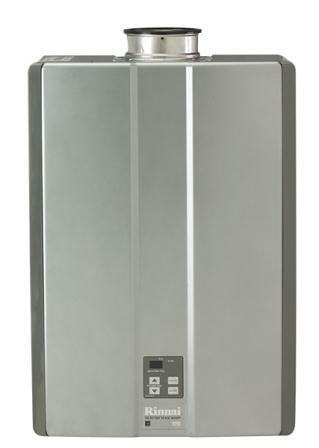 Rinnai RC98i is an indoor tankless water heater that is designed to use both natural and propane gas for potable water heating. As it is using condensing technology it is able to achieve the high energy efficiency of 96% and the energy factor of 0.94. Designed as the indoor direct-vent model, it can use horizontal and vertical concentric venting systems and bring more flexibility during installation. Model RC98e is the tankless water heater that is designing for the outdoor installations only and it is not using the vent pipes for flue gases. Thanks to the modulating gas valve RC98 water heaters can operate between its minimum and maximum heating power, which goes from the low 9,500 BTU to the maximum 199,000 BTU. At the same time, they are able to deliver small amounts of hot water, 0.4 GPM, which is enough for shaving and hand washing, while with the high 9.8 gallons per minute they can supply hot water to up to four plumbing fixtures, working at the same time. Both Rinnai water heaters are equipped with two heat exchangers; one made of the stainless steel and used to recapture the residual heat from the flue gases and other copper-made which uses pre-heated water for the full power water heating right above the gas burner. With the pre-heated incoming water, Rinnai heater is able to achieve high-efficiency of close to 96%. RC98 heaters are able to control the temperature of the outgoing hot water temperature and can adjust the water flow to adjust the temperature setting. Rinnai water heater RC98, even with the condensing technology, can provide continuous water supply, on demand and in an endless flow, for residential and commercial applications. They can also be combined with the hydronic furnaces for home heating and providing hot water, at the same time. Gas and water fitting size is 3/4"
Dimensions: 18.5 x 10.1 x 26.4"